Radio’s share of local auto dollars to remain above 10%: report. 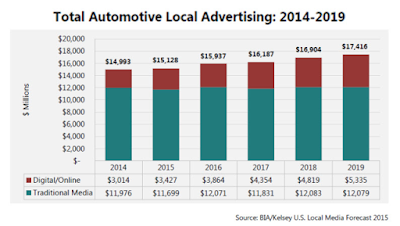 The average auto dealer will spend more than $640,000 on local advertising this year, according to a new report from BIA/Kelsey. Combined with what the carmakers will spend in the local market, it projects $11.3 billion will be spent on local media across all automotive sectors — or more than one out every 10 dollars spent in local advertising. While more dollars are shifting to digital and mobile, the vast majority of automotive ad budgets are earmarked for traditional media. BIA/Kelsey forecasts 77% will go to tried-and-true advertising outlets this year. Radio’s share is estimated at 11.6% for 2015, slipping a point to 10.6% by 2019. “Radio is still an important part of an advertising mix and even as the average quarter hour numbers decrease a little bit, radio still reaches a very sizable portion of Americans,” BIA/Kelsey chief economist Mark Fratrik says. “If you have a local auto dealer with a 72 hour sale this weekend they can be pretty sure he can reach a larger number of people if he does an advertising buy across the top three to five radio stations.” Online radio remains a bit player. The report pegs its share at 0.6% this year, forecasting it to inch up slightly to 0.8% by 2019. That’s in contrast to the rest of digital ad spending, which is forecast to grow 12% a year over the next five years. 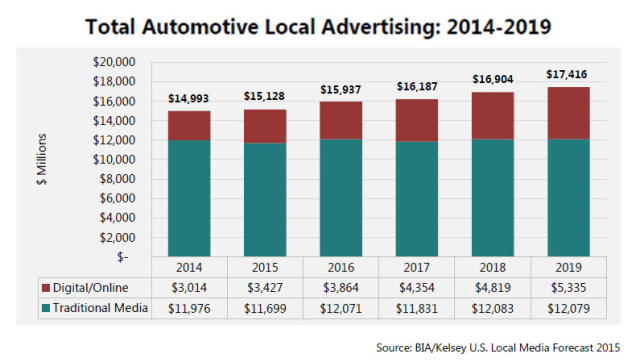 As a result, BIA/Kelsey estimates 30% of all local auto ad dollars will go toward digital by 2019 compared to 12% today. “Broadcasters can play in this game in a big way by showing that multimedia campaigns are complementary and better than just going straight TV, radio or online,” Fratrik says. Why radio is different from newspapers for car dealers. Over the next five years local newspapers are projected to lose a third of their auto-related advertising dollars. BIA/Kelsey forecasts their current share will fall below radio, shrinking to 9.9%, down from their current 14.7%. “There’s an interesting contrast,” BIA/Kelsey’s Mark Fratrik says. “Newspapers will not maintain their share like radio and TV because they play a different type of role.” More consumers are heading to the internet to gather information for their car buying research, which he believes has supplanted the role of the local newspaper for car dealers. “TV is an image with beautiful women and good looking guys driving fancy cars, and radio is a complement to that by providing information about local dealers and sales,” Fratrik says. “I think that has a lot to do with the advertising mix.” That’s backed up by National Auto Dealers Association data which shows local dealers boosted radio spending 14.5% in 2014 to $1.16 billion. As more is spent on digital, the analysis points to most of the new dollars flowing into mobile advertising which Fratrik expects will resemble TV strategies with mobile video dominating. The BIA/Kelsey report — the latest in its series on various advertising verticals — also points out there’s more to the overall auto ad sector than just car dealers. There are also auto parts stores, tire dealers, and motorcycle and RV dealers. Not to mention gas stations, which AdMall estimates spent an average of $29,000 per location on local advertising last year.